Receive a FREE poster set when you purchase the 4 other Kagan Structures Poster Sets as a combo. You receive 30 of Kagan's most popular structures in all. Regular price $70. Combo price $56 • CPKST Save $14! Poster sets also available individually. Each poster set includes six extra large, 17" x 22", colorful posters that illustrate Kagan's most popular structures. Kagan-approved steps for each structure are prominently displayed—a great visual reminder for you and your students. Decorate your classroom, create a structures bulletin board, or hang them on a poster rack to pull up the structure you're using. Teaching Kagan Structures to your students has never been easier! Watch as your students work together successfully. This spinner ensures that everyone participates as teams lead themselves through any set of review questions. Works great with math and science problems. Perfect for book, chapter, and unit review questions. Teammates spin the spinner to find out who asks the question, answers the question, checks the answer, and offers praise or help. Play with any number of questions by teams of 2, 3, 4, and 5 students. Includes class set of eight spinners and storage pack. Regular price $24. Combo price $16 • CSNR Save $8! Turn content mastery into a fun and energizing learning game. Students each receive a Mix-N-Match card. They "Mix" in the room, repeatedly quizzing classmates and trading cards. Your students will have so much fun playing Mix-N-Match, they'll hardly realize how much they're learning. Students love the opportunity to get out of their seats and interact with their classmates. You'll love watching your students master the curriculum like never before. 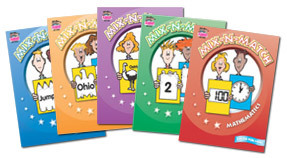 Each book includes 12 reproducible Mix-N-Match card sets based on curriculum standards. Approximately 180–200 pages each. Combo includes all 5 books. Regular price $95. Combo price $76 • CX Save $19! Click here to learn about TeamTools™, powerful software that forms balanced teams with a click. Save on the Kagan Starter Set!